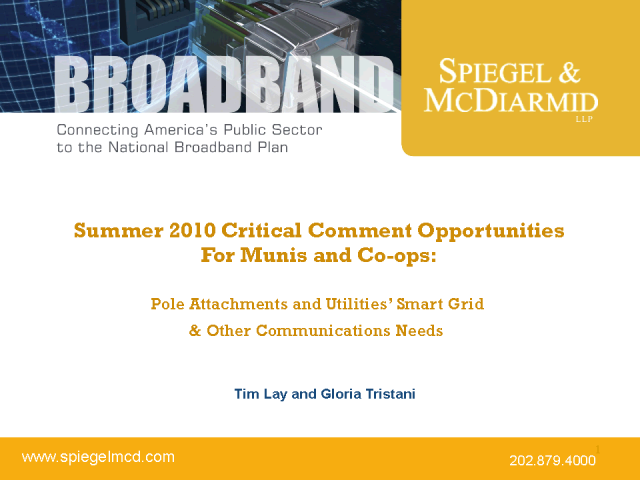 During the summer of 2010, municipal utilities and co-ops will have the opportunity to participate in FCC and DOE proceedings that have the potential to impact current pole attachment revenues and practices and to determine the Smart Grid and other communications spectrum needs of utilities. Spiegel & McDiarmid represents municipal and publicly owned utilities. This channel is used for updating municipally and publicly owned utilities about current regulatory issues in the areas of energy, telecommunications, transportation and climate change.